Belated Eid wishes to all. I was hoping to post this on the Eid day, but things did not work the way it was supposed to be. The guests who were expected to come on the Eid day came yesterday only. 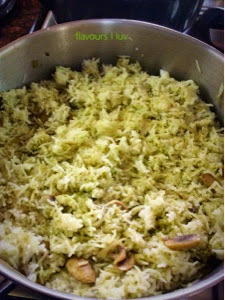 So we celebrated Eid with a simple "Nawabi Biriyani" accompanied with "Pineapple Payasam". Yesterday was the real feast. I served a five-course meal for them. There was mushroom pulao, bhatura, naan, chicken mughalai, mutton roganjosh etc.,. etc.,. for the main course. 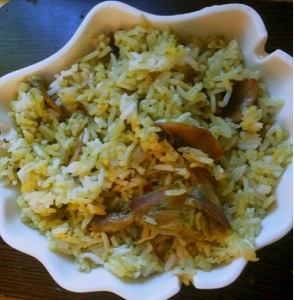 I am posting mushroom pulao recipe this time, other recipes will be published soon. In a pressure cooker heat 2 tbsp of butter, then add cardamom. Add cleaned basmati rice into this, saute for few minutes till all the moisture in the rice leaves out. Add water. Add salt and few drops of lemon juice. Cook the rice till one whistle. Wait till all the steam goes out. In a pan, add 1 tbsp of butter and add the onions. Add little salt and saute them till they turn pink. Add the thinly sliced mushrooms. Mushrooms tend to cook and oozes out water too. When done add this to the rice. Make a fine paste of coriander leaves, mint leaves and green chillies. In another pan, add little butter and add this paste and add a pinch of sugar. Sugar is added to retain the color. Saute for a while and add this to the rice. 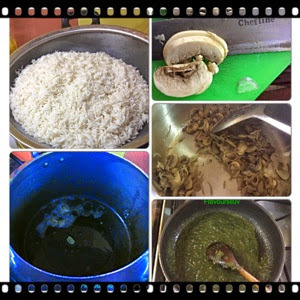 Mushroom pulao is ready to serve.